Another busy month flying by too quickly. Painting is slotting itself in where possible, between the odd gaps that pad the school holidays, cirriculum days, sports days, parent teacher interview days, public holidays, sick days and staff reflection days !@! If I had a real job, I don't know when I would fit it in. As a break from paingting people, I decided to go back to a still life, where I can focus on colour, movement and shape. Humming away in the background I've been working on another idea with my small watercolors on paper. More to come later. 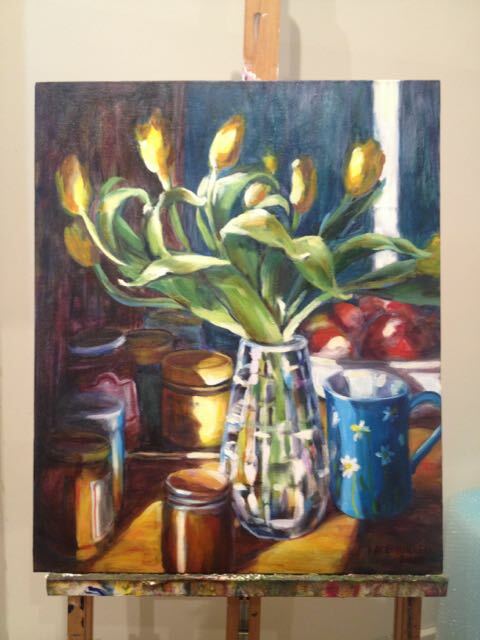 I'll add images to this post as the tulip painting progresses. The studio is clean and tidy, which means I can think. My framer has passed on to me another plaster window display/partition thingy which I picked up yesterday and popped in the window. I like it. I have moved my shelf unit. I have some cards in stock and a small number of 2014 Footy Almanacs left. Let me know if you'd like one. They make great presents and a brilliant record for seasons past, with genuine voices and stories written by the fans. They're $35 each.